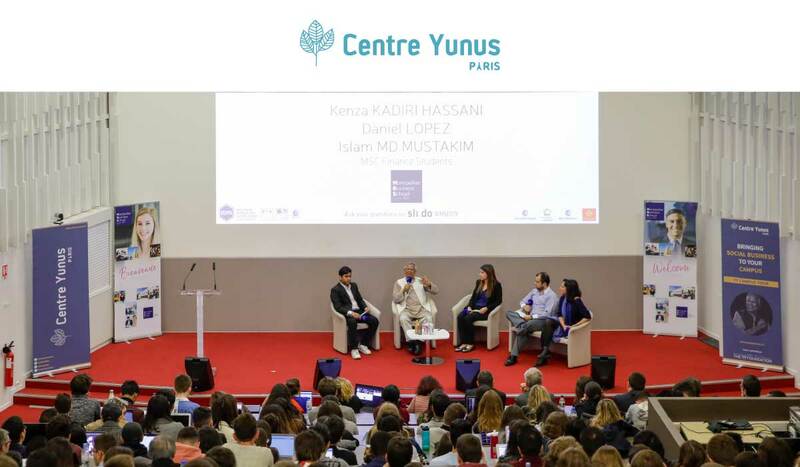 The YY Campus Tour, organized by Centre Yunus Paris with the support of the YY Foundation, aims at raising awareness on social business among the academic world. Between november 2018 and march 2019, exceptional conferences took place in six French universities. The first edition of the YY Campus Tour was held in two waves, from November 19 to 21, 2018, at the Lille Catholic University, SciencesPo and ESCP Europe in Paris, and from March 4 to 6, 2019, at Montpellier Business School, EM Lyon and Dijon Burgundy School of Business, France. The exceptional participation of Nobel Peace Laureate and Grameen Bank Founder Pr. Yunus, the implication of each school, local partners from the social economy and the strong mobilisation of students and professors made this Tour a very successful event. Find here the full conference given at EM Lyon (Lyon, France), on March 5th 2019. 1 partnership agreement signed with Lille Catholic University for the creation of the 71st Yunus Social Business Center, academic research centre social business. Educating, engaging, supporting are the principles that underlie the YY Campus Tour. For this1st edition, these principles translate into two events set-up for and with the students of each campus visited: a round-table conference with Pr. Yunus, students and local social businesses, and a workshop in smaller group to discover or deepen their understanding of social business (among which Groupe SOS Pulse, Meet My Mamma, Les Valoristes Bourguignons, Kabubu, Bon & Bien…). Finally, Centre Yunus aims at supporting and encouraging the creation of research centres dedicated to social business. As of today, 71 Yunus Social Business Centres already exist within universities and academic institution around the world. Created in partnership with the Yunus Centre, they aim at training students in social business through specialized courses, degrees, internships facilitation, assistance in project creation and provisioning of diverse resources. Essential ally to Pr. Yunus’ philosophy, YSBCs are key players in the diffusion of social business. 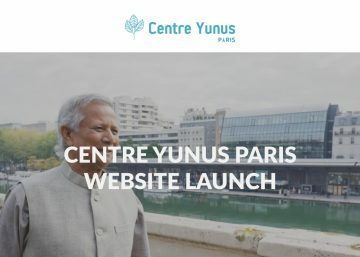 About – The Centre Yunus Paris was created in September 2017 by Professor Muhammad Yunus, Nobel Peace Prize Laureate, Grameen Bank Founder and Honorary Citizen of the City of Paris. Invited by Paris Mayor Anne Hidalgo, the Centre Yunus Paris is settled in the heart of the city, at “Les Canaux”, the house for solidary-driven and innovative economies. The Centre Yunus Paris is the first accredited Centre by the Yunus Centre Dhaka outside of Bangladesh, created to solve the issue of great poverty. It is the permanent resource center for social business in France. It intends to promote a world of three zéros : zero poverty, zero unemployment, zero net carbon emissions.